It can be quite frustrating when an SD card stops working. With the card attached to your camera, phone, tablet, or computer, suddenly you get an error message: “Unable to read” or worse, no indication the system can see the card at all. Or you try to view, copy, or save items to your SD card, but it doesn’t work. 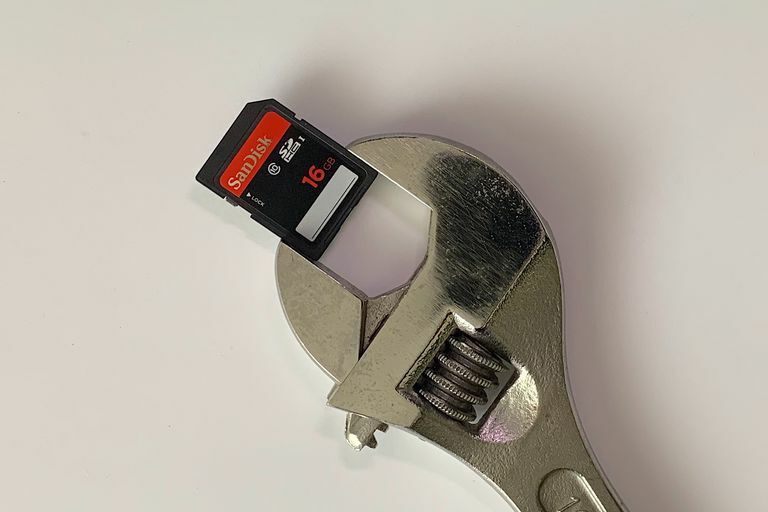 While SD cards tend to work more reliably than many other types of storage, an SD card, or folders and files on an SD card, may still become corrupted or fail. When your SD card fails, try the following four steps in sequence to repair and recover your files. Sometimes, when people encounter an SD card problem, the issue isn’t the card at all, but instead a switch on the card. Many SD cards can be set to stop saving, meaning they’ve been locked into “read-only” mode. Not surprisingly, if you try to write to an SD card in “read-only” mode, you can’t. Locked SD card (left) and unlocked SD card (right). In this case, the fix is relatively simple. Switch the slider on your SD card from the “locked” to “unlocked” position. When the card is unlocked, you should be able to save photos and other files to it once again. An improperly or partially inserted SD card may also present problems that can be fixed by removing the card and reinserting it. Power down your system entirely. Wait for a few seconds after the power is off, then remove the SD card. If the SD card is inserted into a USB card reader, unplug the card reader first, then reconnect it to make sure that the connection isn’t the problem. Start your system. Wait until it has completed the full startup and boot process, which may take several minutes for older and/or slower systems. After the system is fully operational, reinsert the SD card in your system’s SD card reader slot. Once inserted, wait a bit. Some systems attempt to auto-mount and open SD card folders. After a minute or two, if your system doesn’t automatically open and display your SD card files and folders, go ahead and manually browse your file system to see if the card appears. Then, look for your SD card in your file system with either File Explorer on Windows systems or Finder on the Mac. If your SD card still isn’t working properly, you can attempt a repair with built-in system tools on either Windows or macOS. ﻿In the case of windows, you may run a program (Chkdsk) from the command line to fix errors and/or recover information. To do this, you will need to know the drive letter that your system has assigned to your SD card. Open file explorer, as mentioned earlier, then look at the drives listed. Typically, you will see a C: drive as your main drive, along with a different drive letter automatically assigned to your SD card. Select the Start menu (the Windows icon, typically in the lower left of the screen). If you see “Run as administrator” choose that (otherwise, right-click on the Command Prompt app search result and select “Run as administrator” from the drop-down menu that displays). If prompted, enter the administrator password for your system. You should see a command line prompt. Enter “chkdsk d: /r” to repair errors and recover files on your SD card. Replace d: with whatever drive letter your SD card displayed as earlier (e.g., “chkdsk f: /r” for the f: drive). The app will attempt to recover files and folders on your drive. This process can take some time, so be sure to let chkdsk finish before you attempt any other activity with your SD card. A different option, “chkdsk d: /f”, attempts to fix any errors on your card. In most cases, however, if you want to recover data, the /r option will be what you want. On a macOS system, the built-in Disk Utility app includes a First Aid option that attempts to repair any problems on connected drives, including SD cards. Make sure your SD card is connected to your Mac, then do the following. From the main Finder menu, choose Go, then Utilities. Double-click (or double-tap) on Disk Utility to open the app. Select your SD card from the detected drives on the left. Choose First Aid at the top of the screen, then select Run. The app will scan your SD card and try to fix any problems it finds. After you’ve completed the above steps on either your Windows or macOS system, try to use your SD card again to see if it acts as expected. If you still can’t access files or folders on your SD card, a third-party file recovery app may help. Each of the following three apps has a solid history of data recovery. All three are apps you install on a computer, then run to scan and recover files from a connected SD card. Although all three of the following apps can likely help you recover data from a corrupted SD card, the apps vary in price, ease of use, and platform availability. Most people with access to a Windows computer should first try Recuva, by Piriform. The app walks you through a series of simple screens to identify the type of data you want to recover, as well as which drives and file systems to scan for that data. The app then scans the selected drives for files. The free version allows you to recover files, and an upgrade to Recuva Professional ($19.95) adds advanced file recovery, support for virtual hard drives, automatic updates, and customer support. If you’re comfortable with a text-based interface (much like DOS-style programs from the 1980s and 1990s), the free and open source PhotoRec runs on Windows, macOS, and Linux, and can help you recover not only photo files, but also many other formats, including Office, ZIP, and PDF files. However, PhotoRec does require a more technical knowledge than the other apps listed above. For example, you’ll need to understand the file format of your SD card, and on Windows systems you’ll need to know how to run the app as an administrator. But if the interface and additional technical knowledge doesn’t pose a problem for you, PhotoRec can help you recover your data. If none of these three apps works to recover your data, it’s likely that your files will not be able to be recovered.